So there I was, cruising along on the last round of my giant granny square. That’s right, I’ve crocheted up five 100g balls of Taiyo right quick! I was trying to outrun the yarn on the last, rather long go around – the blanket’s going to be about 40″ square – and then when I go to turn the last corner? I neglected to go a proper corner on the previous round. Had to rip back two rounds. On the plus side, I do think there’ll be enough yarn. 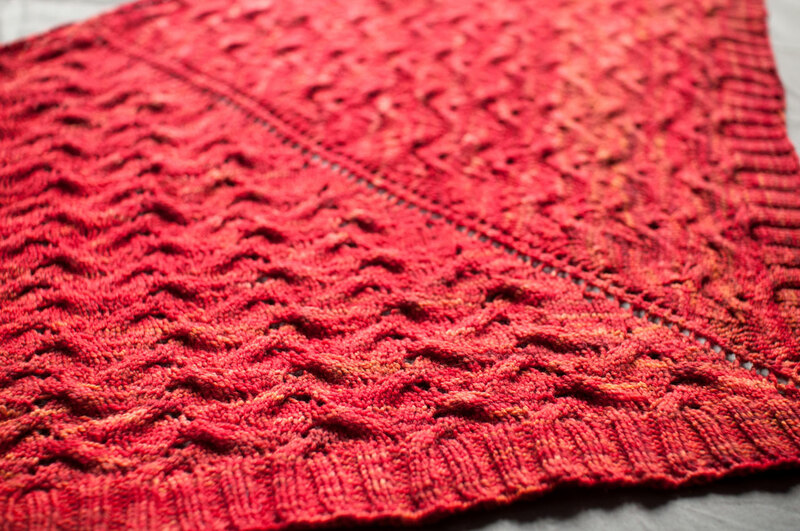 And I’m getting the urge to knit something to back it with, rather than using fabric – maybe just mitred stockinette or diagonal garter stitch, but I don’t know. It might be nice to back it with fabric, and I do have some really nice organic cotton jersey. I’m making one of these for the LYS where I work.. .and I’ve found a few botched corners as I go, but I don’t want to rip back, so I just work 3 DCs into the space between the first and second DC of the not-a-corner cluster, then the chain, then the other 3 DCs into the space between the second and third DC of the not-a-corner cluster. Also, I was wondering if you’d be willing to divulge (in an upcoming post) your ‘go to’ shops if you wanted to pick up some fabric for a project. perfect timing. i follow your blog and find it so helpful. love your sock book. i am trying to do a granny square afghan and after the second colour it starts to bias. It looks slanted. what am i doing wrong.love to see pic of yours. i am using acrylic leftovers. You’re really adventurous to be contemplating *knitting* a backing for your blanket (which looks awesome already–great stash-buster)! I would just get it off the hook and say ok–done. I’ve been reading your blog for a while now and wanted to drop a note to say hi. What better time than on the giant granny-square post! I love the giant granny square. I can also appreciate your frustration with having to rip back. I always try to think of ways to avoid it but I always give in eventually. Good luck – can’t wait to see the finished product! Hopefully your crochet experience mimics mine and that the fixes are easier and less time consuming to make! I suggest backing with fabric. If you back with yarn, you’ll end up with a very heavy blanket–after all, crochet uses up a lot more yarn than knitting, so if you add knitting on top of that, it can get pretty hefty. If you back with fabric, you can make a nice border all around by cutting the fabric larger, then folding over the edges twice to make a doubled edge, mitring (sp?) the corners. Very tidy. That giant granny square totally grabbed my attention. Despite the many, many lots of yarn taking over my guest room, I couldn’t resist buying 10 skeins of Noro Iro in a gorgeous, brilliant colorway just perfect for my family room from a Raveler who happened to be destashing it for a song just to make my very own giant granny square. Now I’m just waiting impatiently for it to arrive so I can start. I can’t wait to see yours finished. I’ve been trying to make a Granny Square for a week, now, and I just can’t get it right. Mine keep looking like a pansy! I’ve watched the videos on YouTube, and I’ve tried other sites and patterns. What pattern do you use for your Granny Square? I would love to know. Thanks! Which reminds me of the time my mom was making a giant granny square afghan and she somehow ended up with not 4 but 5 corners! I never found out how she managed it but it is still a running joke in my family.